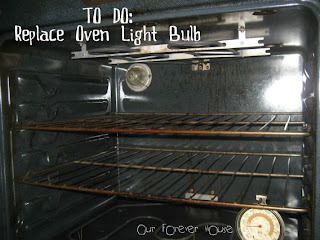 Today I am sharing 3 quick fixes in the kitchen. Three more project to check off our get it done list! Can't believe it took us so long to finish these. I know how this one sounds and honestly, we are not big drinkers but we do keep some bottles around for parties and entertaining. My Dad suggested we move one of the slide-out shelves in a small cupboard to the bottom to allow for the taller bottles to fit. 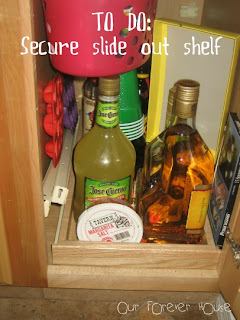 This worked great and the pull out shelf makes it much easier to find what we are looking for. Unfortunately, I took the shelf out but never got it secured. So it sits on the bottom of the cabinet. As expected, it was a quick 10 minute project that has taken a year and a half to complete! 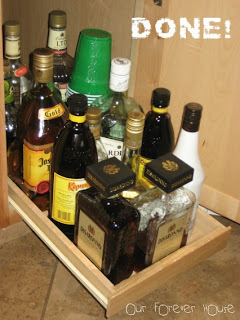 My husband emptied the cabinet and quite quickly got the shelf secured. Easy peasy! I can't believe this one took so long! It is awesome. And of course, when I took my trash loving son to Target and told him we were buying new garbage cans he LIT up with excitement. Nothing pleases this boy more than trash (which is why we own over 12 toy garbage trucks, the Toy Story landfill and oodles of toy and real trash cans). 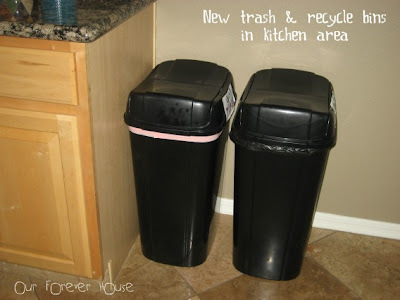 We are big on recycling in our house so we keep a small bin in the kitchen to separate our trash immediately. The reality is, we generally have more (or at least as much) recycling as we do trash - and probably would have more if we had a bigger container. I have been looking for a slim can that we could use side by side in the kitchen so that this area not only looks good but is more functional. We have succeeded. Now, some day I hope to own an awesome Silhouette machine so I can make some fun labels. 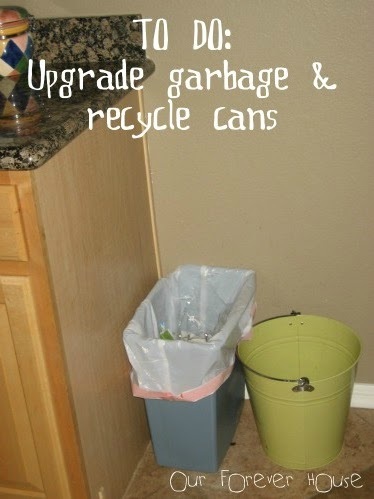 In the mean time, we made trash & recycle signs that are taped to the sides. Works fine but vinyl would be better. A girl can dream! 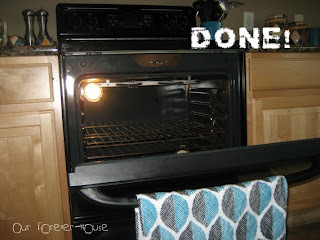 This was a project that should have been completed when we were replacing the glass on the door of our oven but sadly it wasn't. After "asking" at a couple of stores about what type of light bulb we needed and told they didn't carry it, we figured out that it is a relatively standard appliance light bulb. Guess we should have just read the packages rather than asking for advice. Lesson learned, sometimes we know as much or more than the employees at the store. I would say that this is an easy job, however sometimes the contortionist act that we need to do to reach the back of the oven can be challenging and comical. Thank heavens that my husband took on this challenge. Thanks hubby! Check that one off the list! As an added bonus, last week I spent a little time cleaning the inside of the oven too. It looks awesome. It wasn't horrible but I didn't realize how much build up there was on the sides and back of the oven. Check that one off my spring cleaning list! Yay me! Come back tomorrow when I check off a few projects upstairs! Upstairs Projects - check 'em off!